2015 was the year of salted sweets for me, and this brownie doesn’t just take it to another level – it grabs it, shoves it in a cannon and shoots it into the stratosphere. Rich, decadent chocolate. 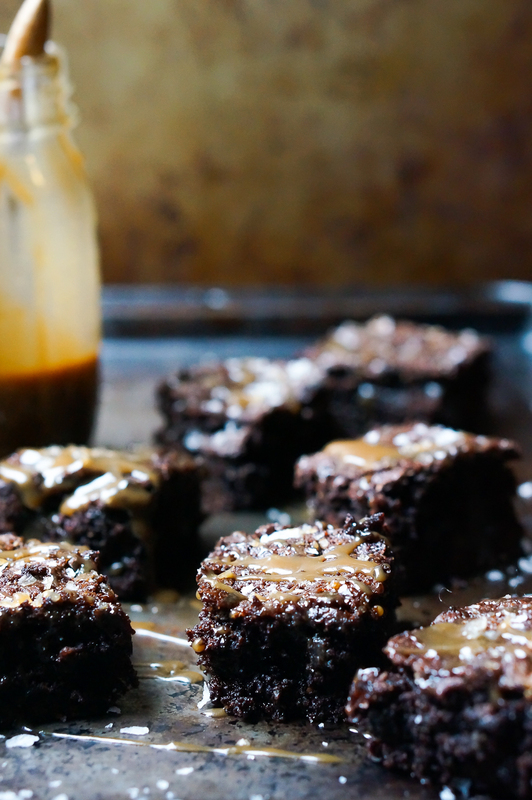 Gooey, sticky caramel (this one’s a finger licker, trust me). Flecks of Maldon sea salt that explode in every bite. It’s the perfect cap to 2015 and a way to keep your resolutions before you even make them, because this little guy (despite looking and tasting very much otherwise) is gluten free, grain free, dairy free and refined sugar free. Speaking of resolutions, are we for them? Against them? I’m personally rather torn – while I think of New Year’s as an arbitrary day to decide to change your life, it’s also nice to have little built in moments to take stock, reflect and – maybe – aspire further towards the pursuit of our best selves. This typically results in me making casual resolutions that are far more about self-nourishment than self-flagellation: I’m going to take an Epsom bath every week, I’m going to stop reading my iPad before I go to sleep, I’ll try to say sorry first when Zack and I fight (I’m so horrible at this). 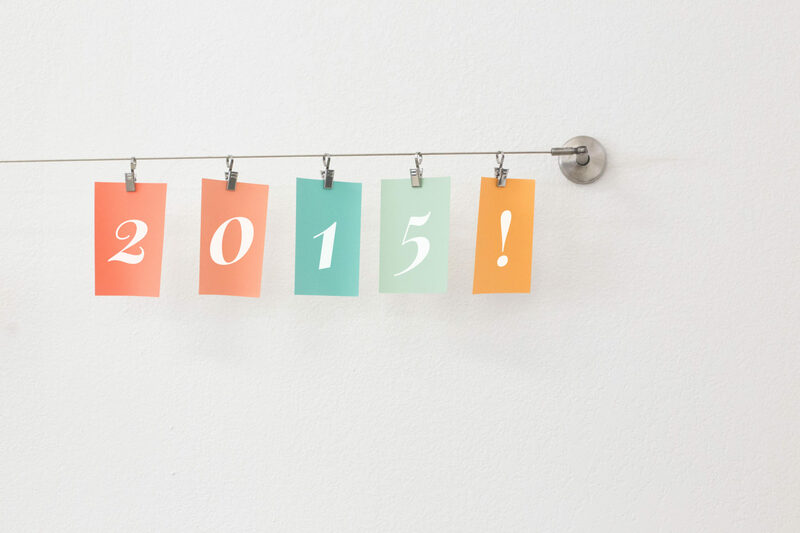 If you do make resolutions, promise me one thing: don’t make it something you beat yourself up over. Don’t call yourself “fat”; don’t force yourself to lose five pounds to be attractive; don’t tell yourself that you need to change your hair/face/body to find the man or woman of your dreams. I hate when magazines trumpet the headline “New Year, New You” because, let’s face it, a day has gone by since the old year, and you’re still – and always will be – you. And you is awesome, and beautiful, and worthy of love, so don’t let the January frenzy make you lose site of that. You’ll lose five pounds when you love yourself enough to feed your body nourishing food. You’ll find the person of your dreams when you find them, and then you’ll miss the time when you were single and could eat ice cream straight out of the tub while you lay naked on the couch. Alright, alright. Let’s get back to the brownies, shall we? 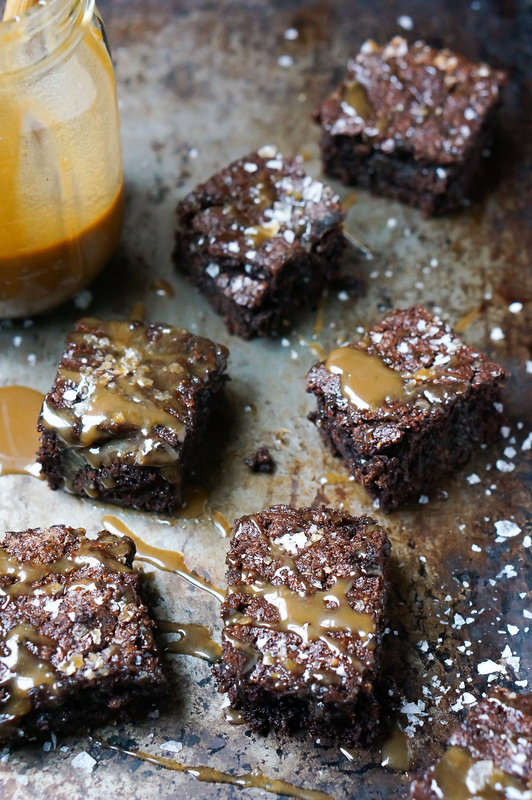 These delicious little nuggets come down to two parts: brownie and caramel (and salt, I guess, if you’re being a stickler, but nature did all the work for that). The brownie is one of those recipes that seems like magic. You’ll look at the ingredients and shake your head, sure that it can’t come together into anything remotely resembling a brownie. But then it does. The top gets shiny and a bit wrinkled, and the insides become gooey and melty and you think not “oh, this is a brownie!” but “oh my gosh, this is the best brownie I’ve ever had!” The caramel is made from coconut milk and coconut sugar (don’t worry; it doesn’t taste coconut-y at all) and it’s dreamy. You’ll stuff it in the brownie and, just in case that wasn’t enough, drizzle it on top. Caramel, caramel, everywhere – and you can drink all the drops. As a little extra New Year’s bonus, I’ve rounded up ten of my favorite party-worthy dishes from around the web. They fall strictly into two categories – appetizers and dessert – because who wants to eat anything other than that on New Year’s Eve? 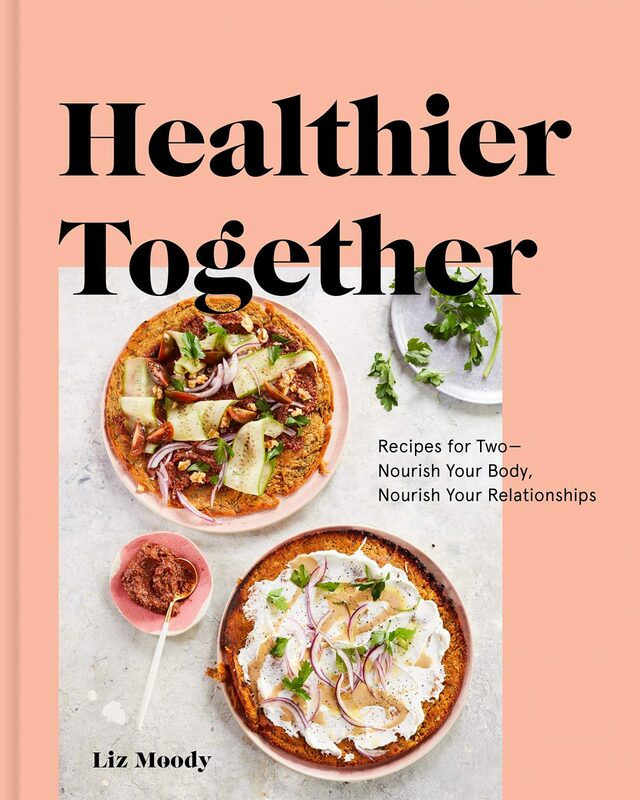 They’re all full of nourishing, whole food ingredients, and many are gluten free, vegan and/or paleo – although all are totally suitable for a non-healthy crowd too (because no one wants to be that person at a party). 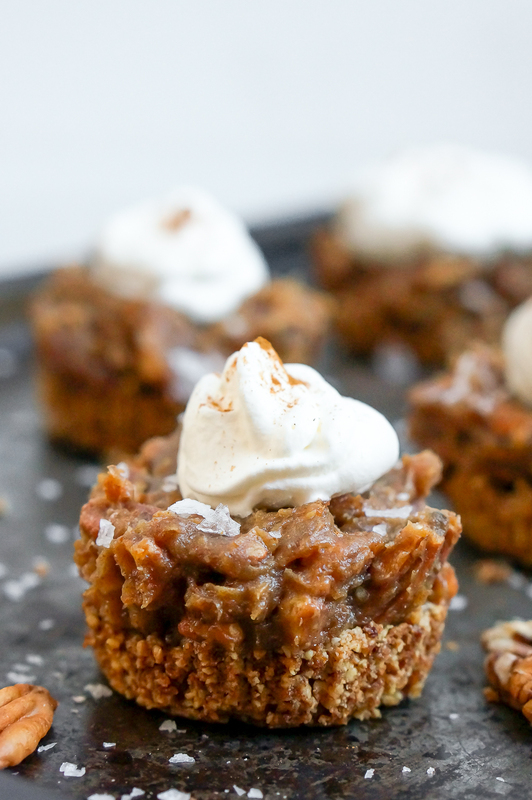 You could also make my Buffalo Cauliflower Poppers, the infamous Snickers Pie, and, of course, these brownies. Although if you make the brownies, I might stay away from any parties, because you’re gonna want to eat them all. Happy New Year to each and every one of you. 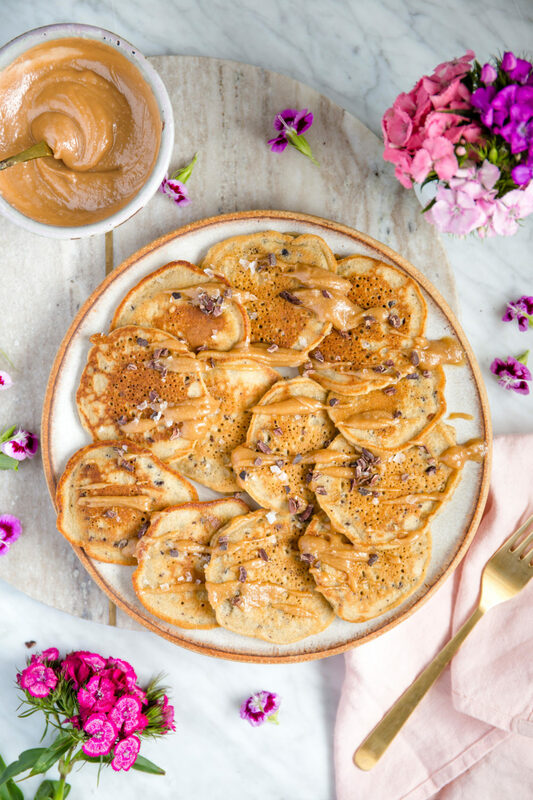 I’d love my last thoughts on this blog for 2015 to be ones of gratitude, and I can’t express how grateful I am to each and every one of you for coming back week after week, reading my rambling thoughts, making my recipes (I so love hearing your feedback when you make my recipes; it feels like pure magic). Thank you, thank you, thank you. I wish you a night – a year, a life – filled with literal and figurative fireworks. First, make your caramel by bringing the coconut milk and coconut sugar to a boil over medium-high heat. Reduce heat to medium low and then, stirring occasionally, continue to simmer for about 30 minutes, or until mixture becomes thick and syrupy. Remove from heat and vigorously stir in vanilla and coconut oil. Transfer to glass jar or container and put in freezer for about an hour, or until mixture thickens. Preheat oven to 350 degrees, then mix together all the wet ingredients for the brownies; set aside. Mix together all dry ingredients then add to wet, stirring until well incorporated. You may have to use your hands for this – it gets quite thick, more like a sugar cookie dough than traditional brownie dough. 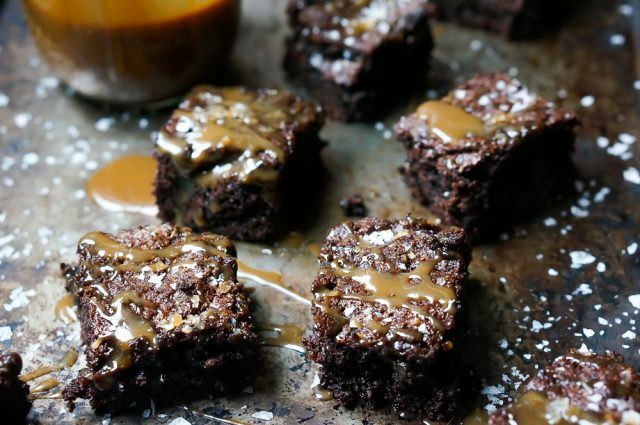 Press it fully into the bottom of a parchment-lined 8″ x 8″ pan, then remove caramel from freezer and spread a thick layer over the brownie batter, stopping about 1″ from each of the edges. Lift one half of the brownie batter and fold it in half, so you’re essentially sandwiching the caramel between the two brownie halves (like a Pop Tart). Press edges shut. The brownie will now take up only half the pan – this is okay, it’ll spread as it bakes. Sprinkle the sea salt evenly over the top, then pop into the oven for 35 minutes. 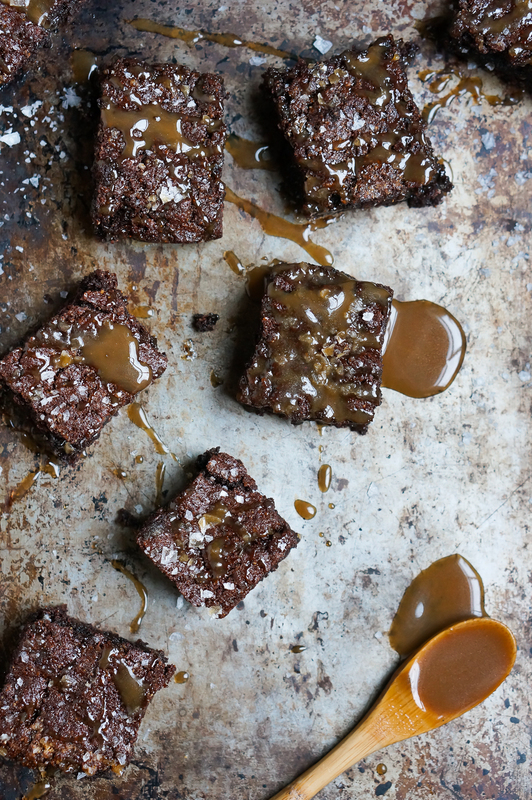 You can either drizzle the remaining caramel over top after removing from the oven, or do it as you serve, topping individual brownies. 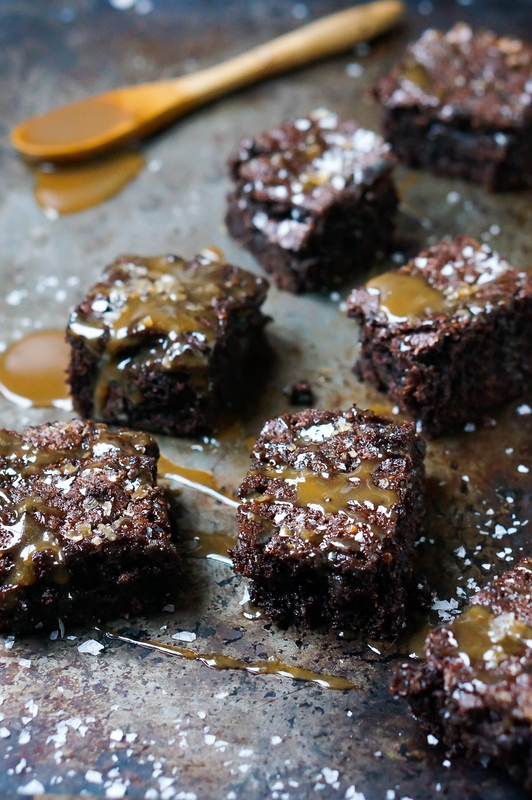 If you store brownies after drizzling the caramel, it hardens slightly into a lovely, gooey, caramel-ly topping. Makes about 12 brownies. The folding part is so confusing and seems difficult. 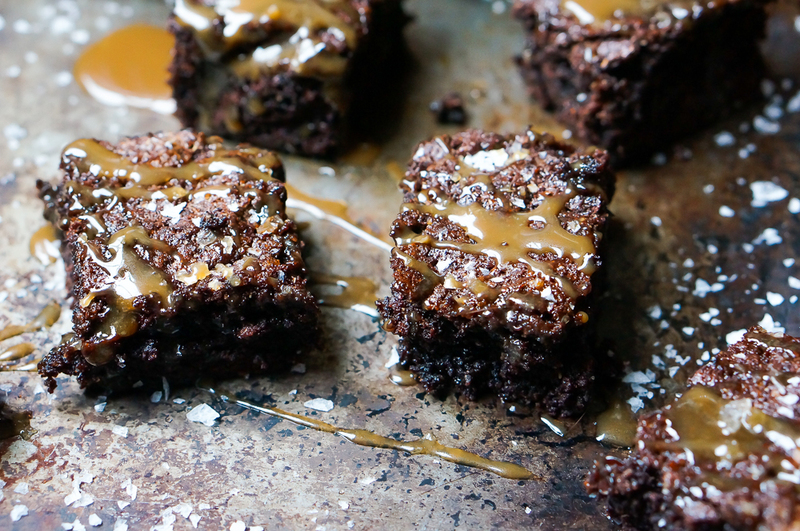 Is it best to just add half the brownie batter, then the caramel, and then the other half? These are amazing! New favorite recipe! Thanks for sharing Liz!